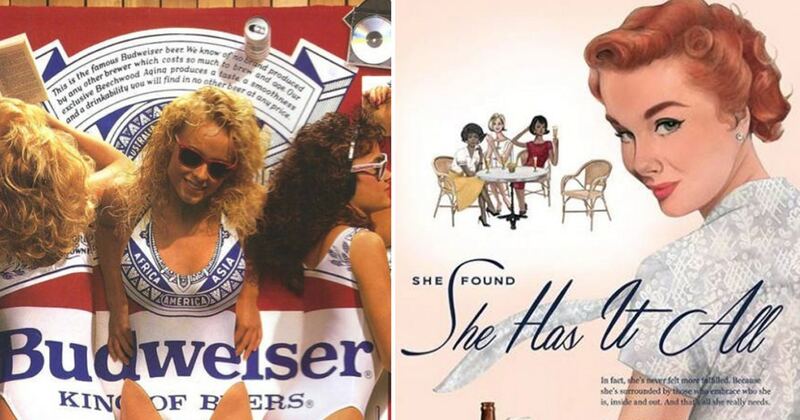 Budweiser tries to apologize for old sexist ads by re-doing some of them for todays woman. There are three big reasons why sexist beer ads have fallen by the wayside over the past few years. 1. Millennials are turned off by sexist advertising that degrades women. 2. Craft beers are taking up big shares of the marketplace and their emphasis on quality means more shots of quality hops and less shots of long legs. 3. More women are drinking beer and beverage companies would rather not turn off potential female customers. On International Women’s Day, Budweiser issued a semi-apology for its long history of sexist ads by reimagining three that ran between 1956 and 1962. The new ads transform the images of women from subservient servers of the frothy brew to empowered consumers who love to pop open a cold one and unwind. The campaign was created in collaboration with SeeHer, an organization devoted to the accurate portrayal of women in media and advertising. 1956: A woman opens a large pot on the stove as a man enjoys a foamy schooner of Bud. Why can’t she have a beer, too? 2019: After a woman’s favorite Chinese food is delivered, she cracks open a Budweiser to enjoy some time to herself. 1958: A woman pours her man a Bud while he fixes what looks like a rotary phone. Because he obviously can’t pour one for himself. 2019: A man and woman cheers each other while they appear to be moving into a new home. There’s also a nice big pizza on the floor that looks like delivery so it wasn’t cooked by the woman. 2019: The headline says it all in this one: “She Found She Has it All.” The woman isn’t fulfilled because she makes a mean pot roast for her husband, but because she has a diverse group of girlfriends and they love having a Bud together.